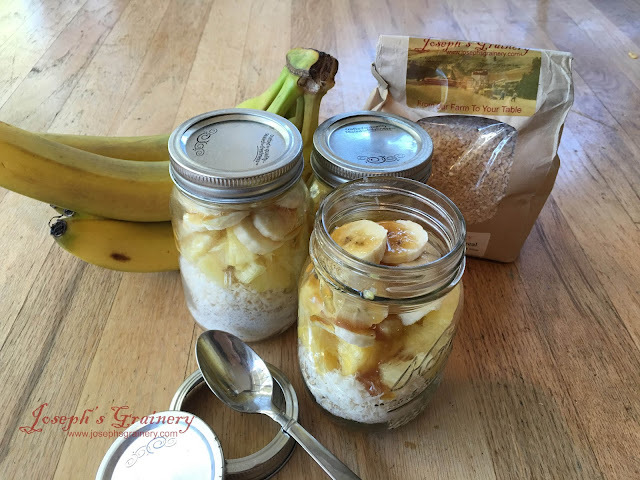 We've fallen in love with the ease of having breakfast all ready to go for us in the mornings, so here's another fun breakfast-in-a-jar recipe, Tropical Whole Grain Breakfast-In-A-Jar. We make them up for the week ahead, then in the morning, all you have to do is add hot water. It's easy to take with us if we're running behind and the combinations of fruits and fixings you can put in the jar are endless! A tropical twist to mix-ins for a whole grain breakfast cereal. Layer all of the ingredients into the jar, except for the water. Secure a lid and store in the fridge for up to a week. When ready to enjoy, add enough boiling water to achieve your desired consistency. Stir and replace the lid. Let sit for 5 minutes before eating. 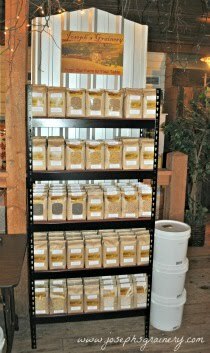 You can use either Joseph's Grainery Cracked Wheat Cereal or Instant Multigrain Mush in this recipe. Using the Cracked Wheat Cereal will give you a cereal with more texture, while the Instant Multigrain Mush will give you a creamier mixture. Give both a try and let us know which way you like yours better!